The one-step method refers to the fact that all the ingredients are simply placed in a mixing bowl at once and blended for about five minutes. 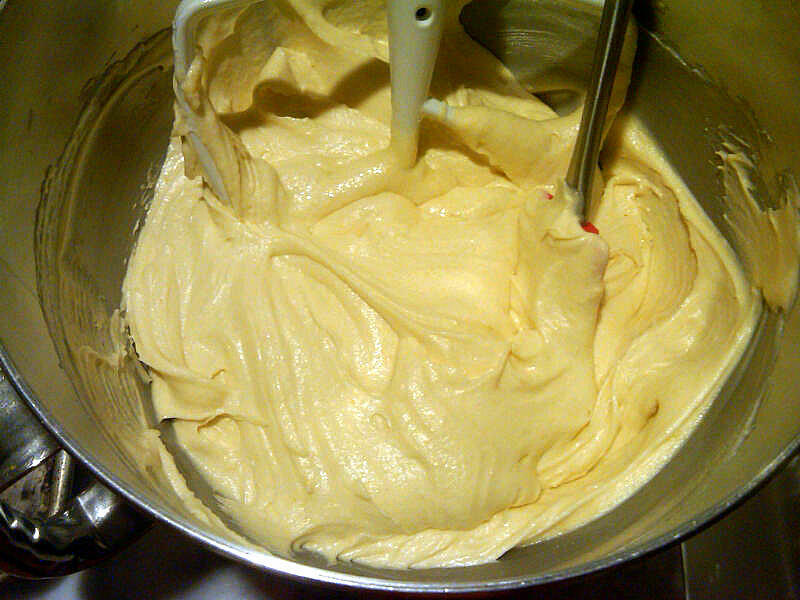 Pour the batter in the greased and floured pan and bake for 60 to 70 minutes. This recipe is so easy and quick to put together, that it was ready before the oven had finished preheating! After five minutes of beating in the standing mixer, the seemingly disparate ingredients, above, transformed into the silky smooth batter, below. 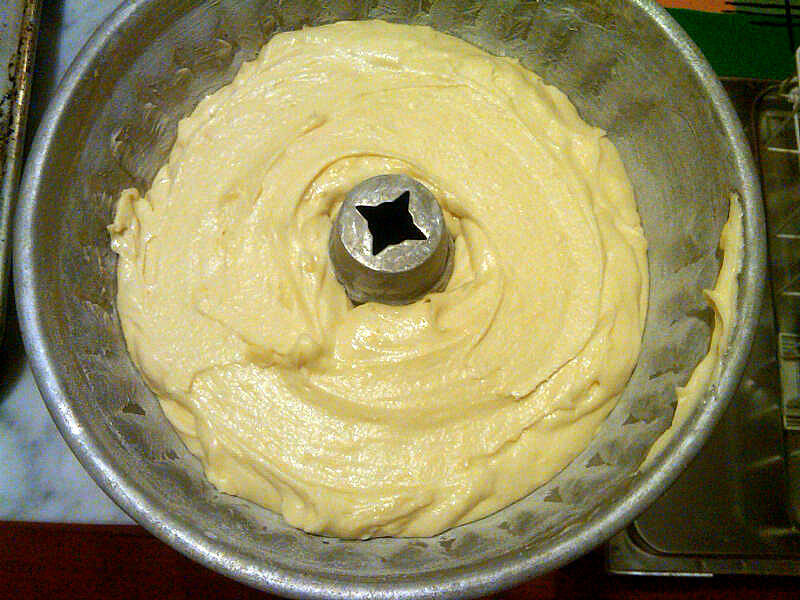 Smooth the batter with a spoon or spatula once you place it in the bundt pan. It doesn't have to be perfectly flat, but as they say in yoga, that's the intention. Let the cake cool in the pan for 15 minutes, release it and let it cool completely. This takes much longer than you'd expect, especially if it's 11:30 p.m. and you're waiting for it to cool so you can wrap it up and go to bed. Always account for cooling time when starting a recipe at night. 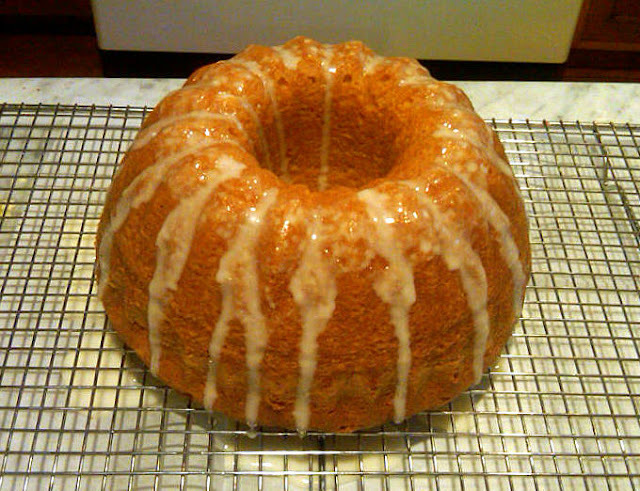 The glaze is simple to make and adds sweetness and even more lemon flavor. The eBay box, that contained this recipe. 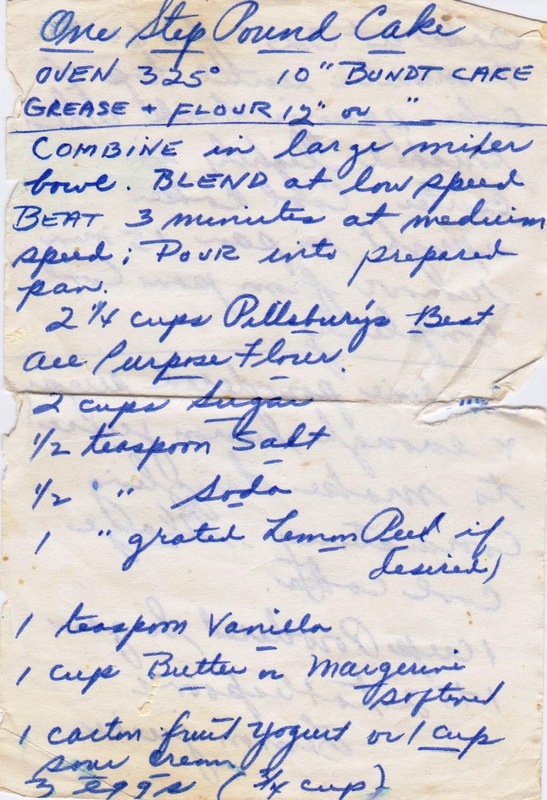 Some production notes: The recipe calls for either yogurt with fruit or sour cream. I used the sour cream, and also butter instead of margarine. 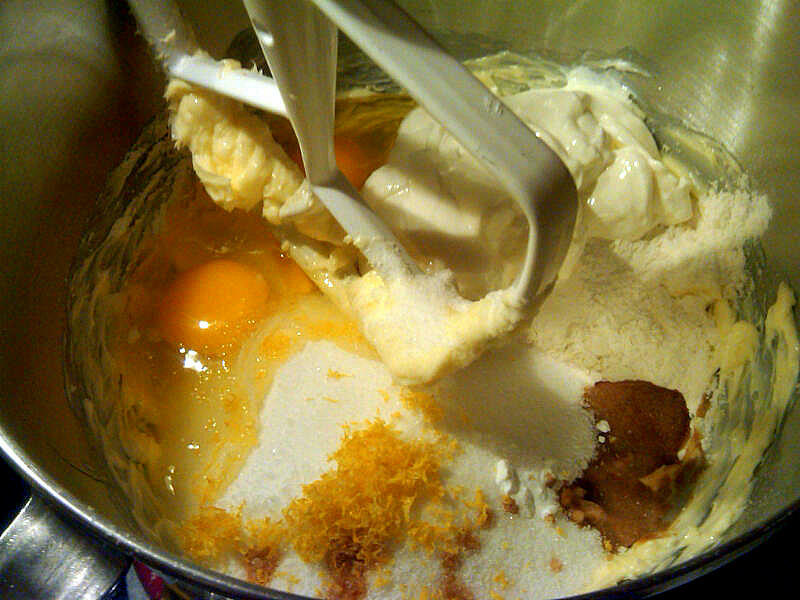 Any all purpose flour will do, and please do not wait after you add the eggs and the sugar to the mixing bowl because the sugar will "cook" the eggs, and you'll end up with bits of cooked egg in your batter. Really! 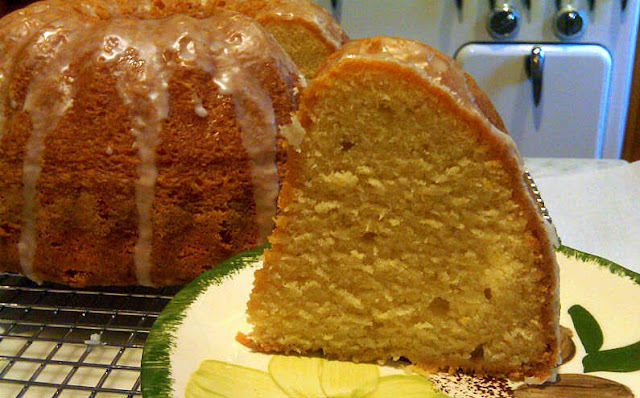 It's essential to grease and flour your pan well to ensure that the cake releases easily. Doing that step took as long as making the cake! How disappointing to find just one worthwhile recipe among all of those! This sounds delicious thoug and the fact that it comes together so quickly is just a bonus. 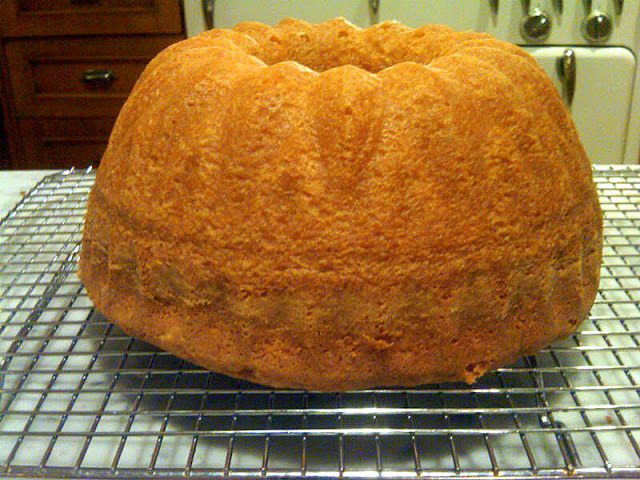 Looks like a great excuse to use my Bundt pan! Tugs Girl: Yes, at first I was disappointed, but my disappointment waned with each slice of cake I enjoyed! I love bundt cakes, mostly because it absolves me of making a "real" frosting. Thanks for writing! When I saw the heading of this post I initially assumed you purchased and planned to review a $28 dollar cake mix from Williams Sonoma. Don't know why I thought this, especially on your blog, except years ago I bought a few of those bundt mixes at the outlet (for less than $28.) Verdict on the Williams Sonoma mixes: overpriced and Overly Sweet. But it is basically the same cake that you produced and yours looks very, very yummy. 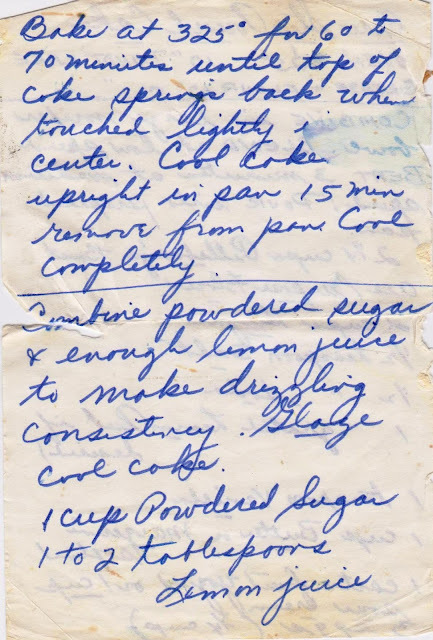 Anonymous: Funny you thought that, for I would rather go without cake than make one from a mix -- it's just almost as easy, and certainly more fun, to bake from scratch. Having said that, I've never, ever turned down a slice of cake that someone else made from a mix. That would be rude ; ) Thanks for writing! I am completely in agreement with you on cakes from scratch. I think I bought the mixes because I thought the williams sonoma brand might be special. At least for me they are not. I even gave one of the mixes away on craigslist and a happy little family stopped by our apartment to pick up the mix for their weekend project. It is just as easy to make the cake from scratch, and although a sweet treat, better for health than eating artificial ingredients. Yes, there's something elemental about scratch baking. I suspect some brands, like Williams Sonoma and Barefoot Contessa, are far superior to more commercial brands like Betty Crocker, but nothing is quite so satisfying as doing it yourself. Glad your mix found a happy home. Oh, and I have never purchased a copy of Ladies Home Journal but I am going to buy it this month to read your article and see photos of your large Brooklyn kitchen. Congratuations! 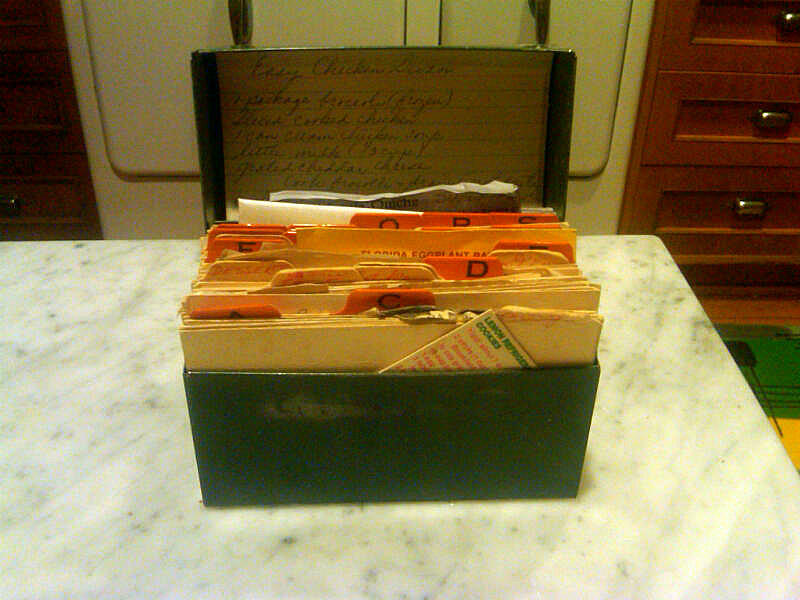 Jane: It's always fun to go through recipe boxes. And often, on the second pass, I find something I've completely overlooked. I remain fascinated by Mrs. Osborn and plan a trip to Bay City this summer to do a bit more research. The most interesting thing I've uncovered (and not even sure it's true) is that there was no Mrs. Osborn; instead she was the creation of a married couple who went into business selling her line of goods: cookbooks, baking pans and vanilla. Her wacky methods mostly involved placing cakes in cold ovens and then gradually raising the temperature until the cake was baked. Also, she had quite a forceful personality, based on her writing (whoever she was)! Thanks for writing! I once read, that if you find an excellent recipe then the book (or box for that matter) was worth buying, no matter the cost. Isn´t that great? That´s how my pile of magazines and cookbooks gets bigger every year; even if I buy one that doesn´t have a great recipe I always have another that has more than one. Law of compensation! Paula-- I love that! I'm sure it's true. You made my day. Thanks for writing. I just read the article about you and boy was I inspired! What a great idea to look for old recipes! I have several from a great grandmother of mine and will look them up again and try them. One is called "Special Cake" That will be my first to try! Lucky you, Anonymous, to have those family recipes. And I do hope "Special Cake" lives up to its name. That's the one I would try first too! Thanks so much for writing. Extremely helpful recipe, was looking for it for a long time. I love this cake and made mistakes every time while beating the cake. Finally have a feeling that this recipe will work. 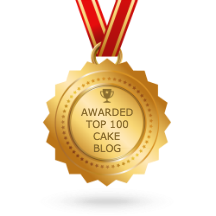 One thing I've read many times, Bloggy Writer, is that one should not overbeat the cake batter (after the flour is added) because that will make for a tough cake. You can beat the h*ll out of cake batters before adding the flour, but after just mix until combined and mix on a low speed. Good luck and let us know how the cake turns out. Thanks for writing! I love how you interact with each other guys, I've just passed and get interested in the title of the post. Keep it up. I'm confused about your statement of the sugar cooking the eggs. What does that mean? Georgia -- Not sure of the exact mechanism, but if eggs and sugar are placed together in a bowl, after a relatively short time, the sugar will begin to "cook" the eggs, i.e., cause some kind of chemical reaction that results in bits of the egg becoming firm, as if they were cooked. I learned this the hard way years ago, when I placed these two ingredients in my mixing bowl, and walked away to take a phone call. I'm sure you can find out details from food scientists like Harold McGee online somewhere, but the bottom line is: start mixing the minute the sugar and eggs hit the bowl.